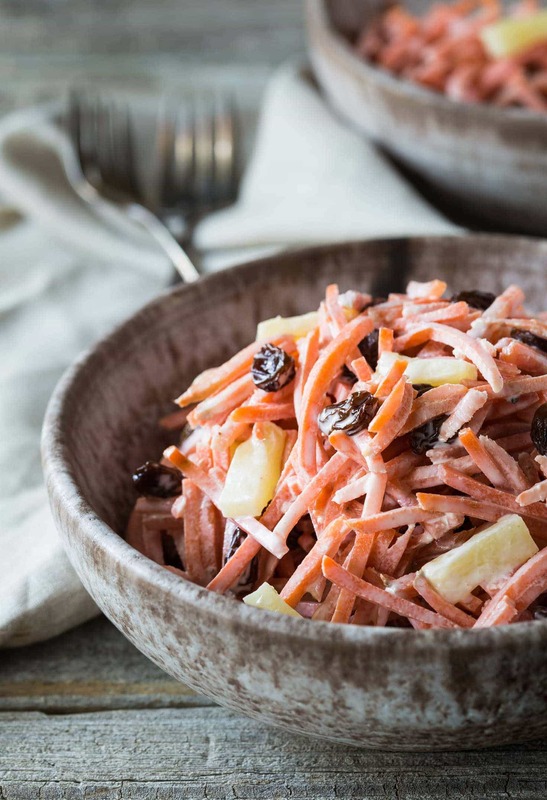 5 Minute Carrot Raisin Pineapple Salad! 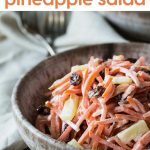 A very easy nutritious Paleo, Whole 30, and Gluten Free Carrot Raisin Pineapple Salad that requires no cooking and can be made in just a few minutes! I ate out at Whole Foods a couple of times over the holidays, they have quite a nice selection of gluten free items on their menu that I can eat and enjoy. 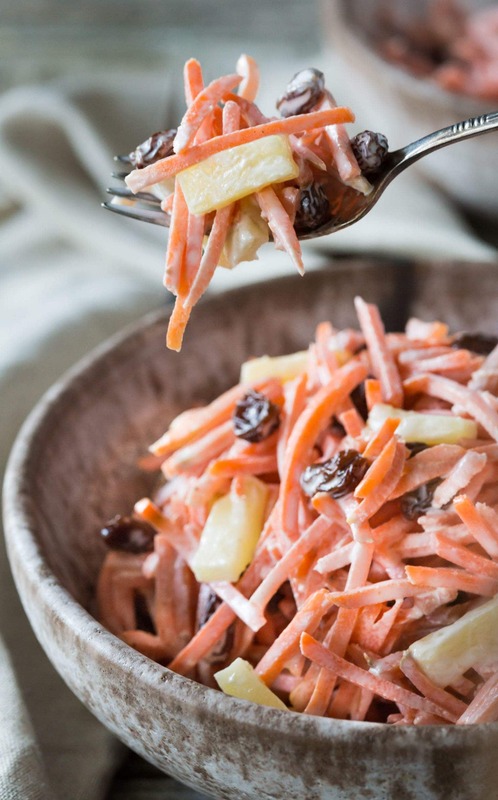 One of my favorites foods to eat there is their Gluten Free Carrot Pineapple and Raisin Salad, I eat it with almost everything! It’s such an easy recipe to throw together and there no cooking involved so there’s not a whole lot to say about the preparation, but I will share just a couple of quick notes. I used a bag of already shredded carrots from the grocery store the first time I made it. While it was very convenient to have ready shredded carrots I found that they were much more crunchy than freshly grated carrot. What you choose to use is down to your personal preference and how much time you have! I used canned pineapple in juice rather than syrup as I didn’t want the added sugar. I’m sure fresh pineapple would taste fantastic in this salad but I didn’t have any at the time. And lastly, I soaked the raisins in boiling water for a few minutes to plump them up a little, this step is entirely optional but I thought is softened them up a little bit more. The salad will keep in the fridge for a day or two but the mayonnaise does tend to thin out a little bit after a day or so in the fridge, my last batch didn’t last that long as we ate it in one sitting. MORE OF MY FAVORITE EASY RECIPES! Watch my Quick Recipe Video! It's in the post right below the recipe directions. This part is optional, but I like to add the raisins to a cup of boiling water for five minutes to plump them up, then drain and pat dry on paper towels. Mix all remaining ingredients together and serve! NOTE: I didn't add honey as I thought it was sweet enough, but you may prefer it sweeter, honey is not whole30 compliant. If you enjoyed this recipe, please leave a comment below! I would’ve never thought to put all of these ingredients in a salad but I am kind of loving it! So pretty too! I love easy recipes like this! No cooking is my favorite! This is a combination that is very creative and sounds like I need to try it! Carrots are so naturally sweet that I’ll bet this salad is ultra delicious. Love the combination of pineapple and raisins too. I can’t wait to try this. This reminds me of an old school salad that they used to serve at church potlucks. 🙂 Love the sweet flavors in this. Sounds delicious! This salad is screaming my name! I love how easy it s to make! Can’t wait to try this! I grew up eating carrot salad and loved it! I haven’t had it in years but now this post has me craving it like something fierce! This is a lovely salad Sheena – I could eat it with anything too 🙂 Hope you had a wonderful holiday. Thanks Anna, it’s one of my favorite salads! Hi! Since this is Whole 30 I’m assuming you found raisins with no added sugar. Where did you find them? I can’t seem to find any. Thanks! Hi, I’ve never seen raisins with added sugar, all the brands I’ve used in the USA and the UK are always sugar free. I have Target Market Pantry raisins and the only ingredients are raisins, pretty sure that Sun Maid Raisins are the same. Are you perhaps thinking of craisins which are dried cranberries with sugar added? I made this for my family today for lunch. It was a HIT!!! My kids absolutely love it. I think I found my new pot luck go to! Thanks for sharing this recipe. I’m allergic to pineapple. What other fruit could I substitute? Hi Mari, I’m sorry to hear about your allergy. I think that mango or peach (with the skin removed) might be really nice as well but I’ve not tried it. Would veganaise be whole 30 approved? Hi K.D., unfortunately it’s not Whole30 compliant as it contains canola oil,soy, and brown rice syrup. What would you suggest as a vegan mayo substitute? I don’t think there is one that is both vegan and Whole30 compliant that I’m aware of, but I’m not a vegan so there may be an option I’m not familiar with. The Whole30 diet eliminates grains, legumes and beans so it’s hard to make it fit with a Vegan diet as it eliminates most vegan sources of protein except nuts, it’s relies on meat, fish and eggs for protein. You could have a google around for something like’ no mayo creamy whole30 dressing’ or ‘egg free creamy whole30 dressing’ and see if there’s anything out there that someone else has come up with. I’m sorry I’m not much help, I know it’s hard when you’re trying to avoid certain foods. Hi Kristen, I often make my own mayo too! the honey is listed as an optional ingredient in the directions so whole30 people or those who don’t need the extra sweetness can omit it. I love this! Reminds me of my grandmother. Just made some to take to a friend’s for dinner! It’s so good, thank you! This looks so good …. can’t wait to try it tomorrow. 2. Cranberries instead of raisins. 3. To add crunch, maybe sunflower or pumpkin seeds. I love this recipe, and I like to put a spin on it sometimes, just to keep it fresh. Just going to make it, but wondering how many it serves. It has the nutrition label, but not the amount, so it does not help. So funny how the old recipes keep showing up in blogs!!! The lunch ladies at my elementary school back in the late 60s & early 70s served this to us! I loved it!